You prolly know from Psyche classes that the mind uses size to get its depth cues, which makes large objects appear closer than they really are. This is especially true with half Dome, cuz it's so big. You think it's close, but it ain't. After hours of hiking up a steep grade, you find yourself in a trance-like state. The body is a type of chemical plant, and you'll have plenty of chemicals reactions going on during your climb, which will naturally affect your mind. You'll feel closer to God & have many insights into the meaning of life on the trail. Life becomes simple again. You'll feel invincible at times. Take short breaks, so the lactic acid doesn't have time to build up in your muscles, cuz it can take a while to work it back out. Sometimes you pass people who are on their way back down - who started hiking up the night before. At watched the sun come up from the top of Half Dome. The moon was nearly full during our climb, so it's entirely possible. 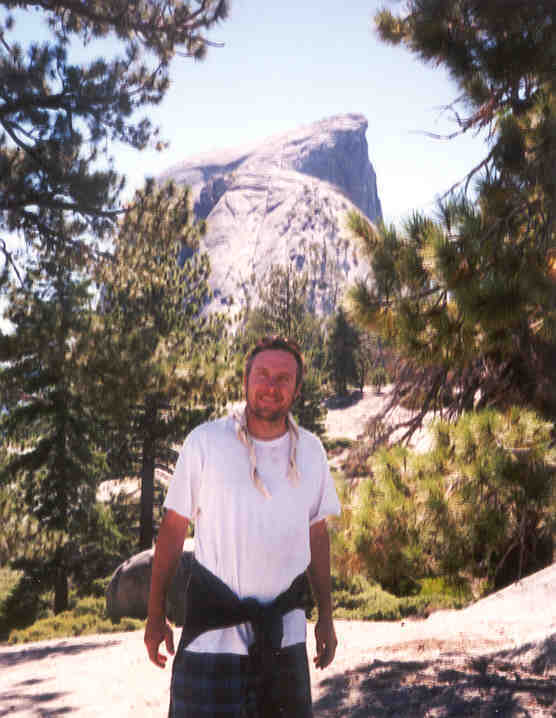 See that mtn in front of Half Dome? That's Quarter Dome - our next stop. Quarter Dome is steep. Very tiring. Some say Quarter Dome is the worst part of the climb - but don't believe it. =). Wait 'til you see the cables. Yikes!